In every house, there must not be only scrumptious meals on the tables, but also healthy and gluten-free! If you are looking for some delicious recipes that do not have to contain gluten, this is the article you want to read. Get your paper and pen, and try making these tasty foods for lunch, dinner, and dessert. 1. Prepare your oven and preheat to 80 degrees Celsius or 175 degrees Fahrenheit. Put a medium dish in it to warm. 2. Place a skillet in medium heat. Brush the pork chops with oil before heating in the skillet. Cook for around 5 minutes and flip the side to another. Transfer it to the dish in the oven and preheat. 3. Mix brown sugar, nutmeg, cinnamon, salt and pepper in a bowl. 4. Back in the skillet, place butter, apples and the mixture of brown sugar. Cook until the apples are tender. Cover for easy cooking. 5. 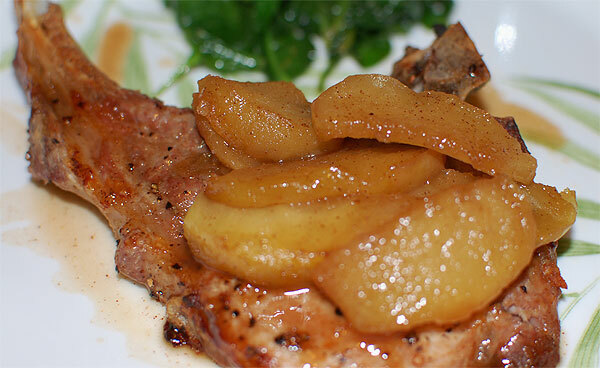 Remove apples from the skillet and place over pork chops in the oven. 6. Keep cooking the remaining ingredients in the skillet until it becomes thick. 7. Pour the sauce over the apples and pork chops, then serve. 1. Heat a saucepan for a minute and pour oil under medium heat for another minute. 2. Place garlic and onions in the pan to sauté until they are slightly brown. 3. Add quinoa into the pan, followed by vegetable broth. 4. Sprinkle cumin, cayenne pepper, salt and pepper over quinoa. 5. Let the mixture boil, and then cover under low heat for 20 minutes. 6. Add corn and simmer for another 5 minutes. 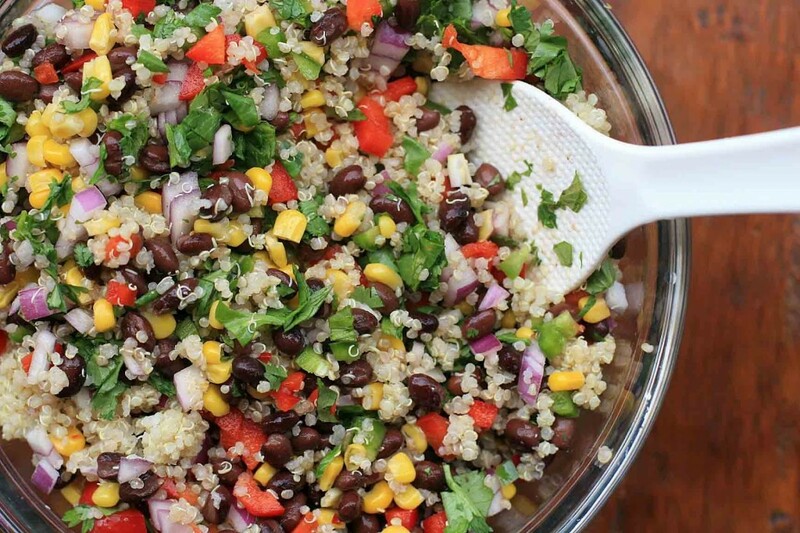 Stop heating and mix cilantro and black beans. 1. Make the dressing: place cumin seeds in a skillet in low heat for a minute or until brown. 2. Grind cumin seeds using a mortar and pestle. 3. In a bowl, mix powderized cumin seeds, lemon juice, honey, olive oil, salt and cayenne pepper together. 4. 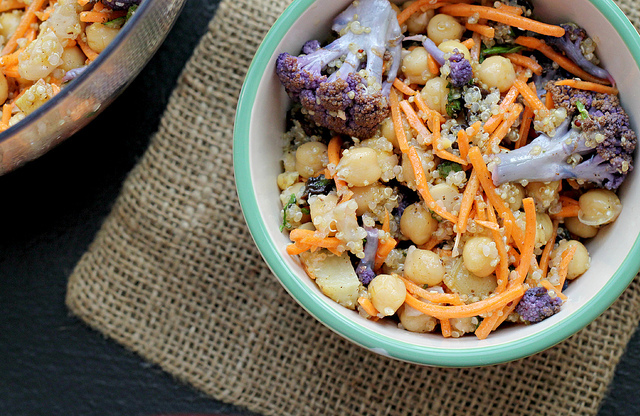 In a separate bowl, toss chickpeas, carrots, dried plums or dates, almonds and mint. Stir well. 5. Refrigerate for 20 to 30 minutes. 6. Serve with the dressing. 1. 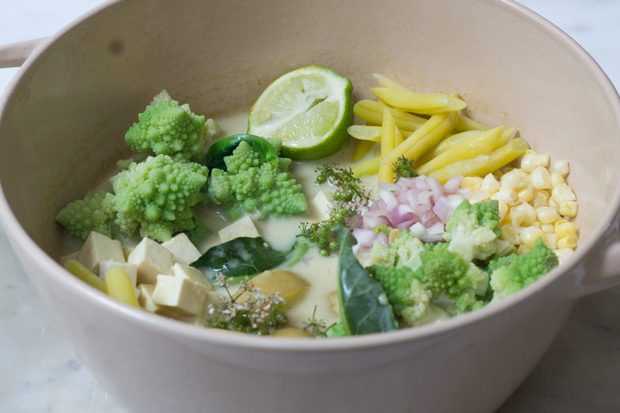 Using a mortar and pestle or a food processer, mix all the ingredients of the green curry paste. Set aside. 2. Place a pot on the stove in medium-high heat. Put tablespoons of thick coconut cream from the top of coconut milk. Allow to simmer. 3. Add 2/3 shallots in the pot and sauté for 2 minutes. 4. Add curry paste and salt for 2 minutes. Check if it needs more curry paste and salt. 5. In a saucer, squeeze lemon juice over shallots. 6. Pour the remaining coconut milk into the pot. 7. Toss all the potatoes. Cover and bring to a simmer for 15 minutes. 8. Add green or yellow beans, broccoli or Romanesco florets and tofu. Simmer more. 9. Add corn kernels right before removing from heat. 10. Sprinkle with shallots, lime juice and cilantro. 1. Preheat the oven to 175 degrees Celsius or 350 degrees Fahrenheit. 2. Line paper baking cups into the cup or muffin pans. 3. Beat cream cheese and butter in a bowl. Add vanilla and confectioners’ sugar. Set aside. 4. Mix rice flour, millet flour, baking powder, baking soda, cocoa, xanthan gum and salt in a bowl. Stir well. 5. In another bowl, mix eggs, sugar, sour cream, milk and vanilla. Stir. 6. Combine flour mixture and egg mixture. Stir thoroughly. 7. Spoon the final mixture into each cup. 9. Add cream cheese frosting on top. 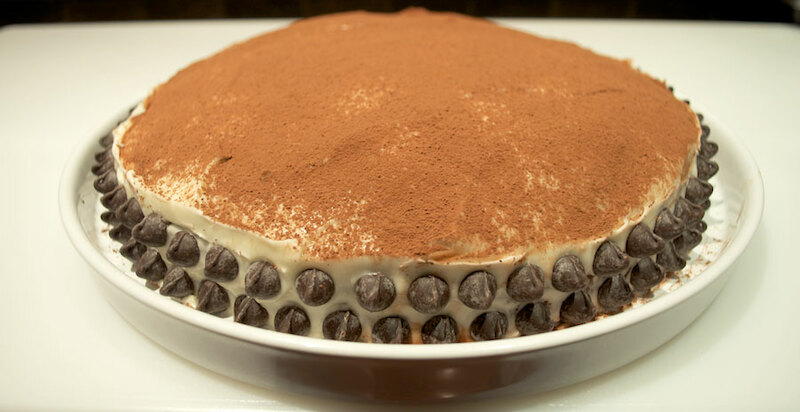 All of the recipes you have learned here are not difficult to do and inexpensive to make. Not to mention how delicious and healthy they are due to the absence of gluten!